Now in paperback, the new novel by Leif Enger, author of the million-copy best seller, Peace Like a River, is a lively, big-hearted redemption tale; an unforgettable, picaresque Western yarn. In 1915 Minnesota, writer Monte Becket has lost his sense of purpose. His only success long behind him, Monte lives simply with his wife and son until he befriends outlaw Glendon Hale. Plagued by guilt over abandoning his wife two decades ago, Glendon aims to go back West on a quest for absolution. As the modern age marches swiftly forward, Monte agrees to travel into Glendon's past, leaving behind his own family for a journey that will test the depth of his loyalties and morals, and the strength of his resolve. As they flee the relentless ex-Pinkerton who's been hunting Glendon for years, Monte falls ever further from his family and the law, to be tempered by a fiery adventure from which he may never get home. 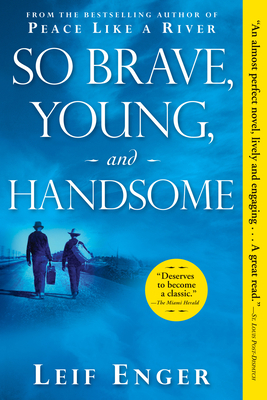 With its smooth mix of romanticism and gritty reality, So Brave, Young, and Handsome examines one ordinary man's determination as he risks everything in order to understand what it's all worth, and follows an unlikely dream in the hope it will lead him back home.